Birmingham-based researchers are conducting a ground-breaking new study to investigate the effectiveness of giving patients blood products immediately after a major injury or trauma – before they reach hospital. Currently when patients have been injured and are bleeding, either clear fluids or blood products may be used to replace lost blood en-route to hospital – but the approach varies by region. This variation occurs because the effectiveness of giving blood products, such as packed red blood cells and freeze dried plasma, pre-hospital has not yet been scientifically tested and universal provision would have significant clinical, logistical and cost implications. Researchers at the NIHR Surgical Reconstruction and Microbiology Research Centre (SRMRC) – which specialises in trauma research – hope to provide solid evidence one way or the other with the RePHILL (REsuscitation with Pre-HospItaL bLood products) multi-centre randomised controlled trial (RCT). The NIHR, the research arm of the NHS, has backed the project with £1.8 million funding over four years from its Efficacy and Mechanism Evaluation programme. The Chief Investigators are Gavin Perkins, Professor of Critical Care Medicine at the University of Warwick and a consultant at Heart of England NHS Foundation Trust, and Dr Nicholas Crombie, consultant trauma anaesthetist at University Hospitals Birmingham NHS Foundation Trust and a doctor with the Midlands Air Ambulance Charity. Professor Perkins said: “Major trauma is a major cause of death in the UK. Treatment with blood and clotting factors can be lifesaving, but blood is a scarce resource and we currently don’t know when and where the best place to administer it is. “The RePHILL study will explore whether giving blood and clotting factors outside of a hospital is safe and more effective than giving it in the resuscitation room in hospital. Dr Crombie added: “In the trial, air ambulances and ambulances will be randomly stocked with or without blood products. Therefore, for eligible patients, the receipt of blood products prior to hospital admission will be determined by what the ambulance that attends to them is carrying. “The research team will then look at a number of outcomes, including mortality as well as physical and biochemical evidence of the effectiveness of resuscitation, in order to determine whether there are any differences between those who receive blood products and those who receive clear fluids. Professor Karim Brohi, Professor of Trauma Sciences at Barts and the London School of Medicine and consultant in trauma and vascular surgery at the Royal London Hospital, backs the study. “Bleeding after severe injury kills millions of people around the world each year, often within minutes to hours of injury,” he said. “Life-saving interventions tend to be more effective when given early, and giving blood and plasma within minutes of injury is one possible way to improve outcomes in the most critically injured patients. “However moving blood products out of hospitals and onto ambulance services is challenging and potentially costly. “The RePHILL trial is important for the NHS and for global trauma care as it should help us to understand the benefits and challenges of delivering blood at the scene of the accident – in effect moving the hospital to the patient. 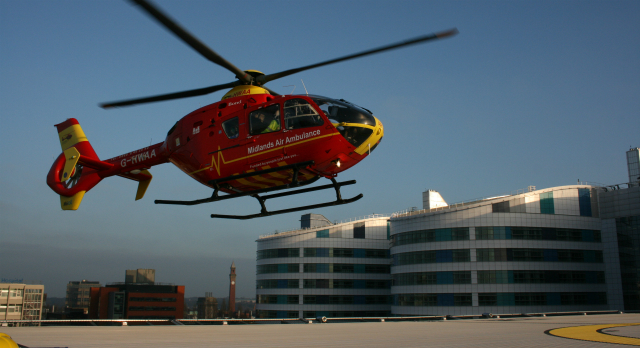 The SRMRC team will be working with colleagues from the Queen Elizabeth Hospital Birmingham, University of Birmingham, University of Warwick, Midlands Air Ambulance Charity, West Midlands Ambulance Service, East Anglia Air Ambulance, Essex and Herts Air Ambulance, MAGPAS Helimedix, The Air Ambulance Service and the NHS Blood and Transplant Service. The trial will be managed by the University of Birmingham Clinical Trials Unit (BCTU), a UK Clinical Research Collaboration (UKCRC) registered trials unit with experience in co-ordinating large scale multi-centre clinical trials.